+$8 per additional hour. Jump times start every 15 minutes! Add time when you book online, or buy at Fly. LIMITED TIME OFFER: 1 hour of jump time includes a FREE $3 game card! 50% OFF jump time on Mondays! For active military & their immediate family members. Present valid military ID at Fly to purchase. Applies to jump time only, jump socks not included. Our Party Propulsion staff hosts parties for kids, teens & more. Book a custom party today! Fly high with great values and an event customized to the specific needs of your group! Fly Trampoline Park offers weekly specials and events. Check back often for the latest specials and see our Events page here for more details. 50% off jump time ALL DAY for active duty military and immediate family. Book in person at Fly. 1-2pm, $10 per session. Get your heart rate up at our brand new fitness classes! Camp is offered during class for your little ones for $5 a child. Ages 3-12. Children can be added during check-in. 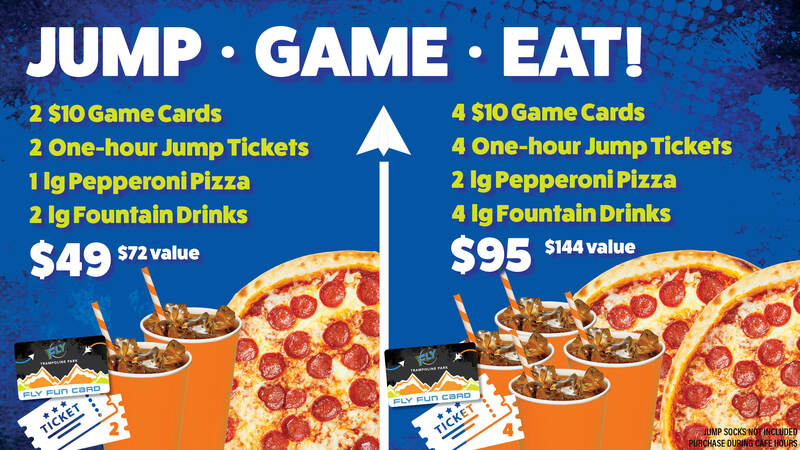 6-9pm, $65 for a family of 4 including 2 hrs of jump time, 1 large pizza, 1 pitcher of soda & 4 $5 game cards. Add additional family members for $15/person. 1-3pm, $12 for 1 hour of jump time, $8 for the second hour. Homeschool students only. Registration and painting coming soon! Get great deals on food and jump packages: call 357-5867 for details! Join us for a FAMILY FUN FREE event! Bring your cards, handhelds & hops! This is an all Pokemon, all hands in event at Fly Trampoline Park. Trade, game, and jump the day away! Drop your kids off for some jump time, crafts, and games with our amazing staff! Ages 3-12. We have GLOW everything! Face Paint, Rings, Necklaces, Lights & bumpin music! Game cards for arcade play can be purchased for any desired amount. Game cards are used for arcade games ($1-$2), the Laser Maze ($1), Virtual Reality ($6), Massage Chairs ($1 for 3 minutes), and the Photo Booth ($3). You can build up points to redeem prizes at our redemption counter by playing games in the arcade!